Smelts? I know it’s Lent and all the stores get their fresh fish on, but Fiesta has smelts for 99c/lb. Smelts. For 99c, I might head over and get some, and see what the internet has to tell me about cooking tiny shiny fish! I will obviously report back if this happens, but I’m still working on getting around to the pork dumplings from last week, so don’t hold your breath. Then again, smelts. Maybe holding your breath would be smart. Your call. 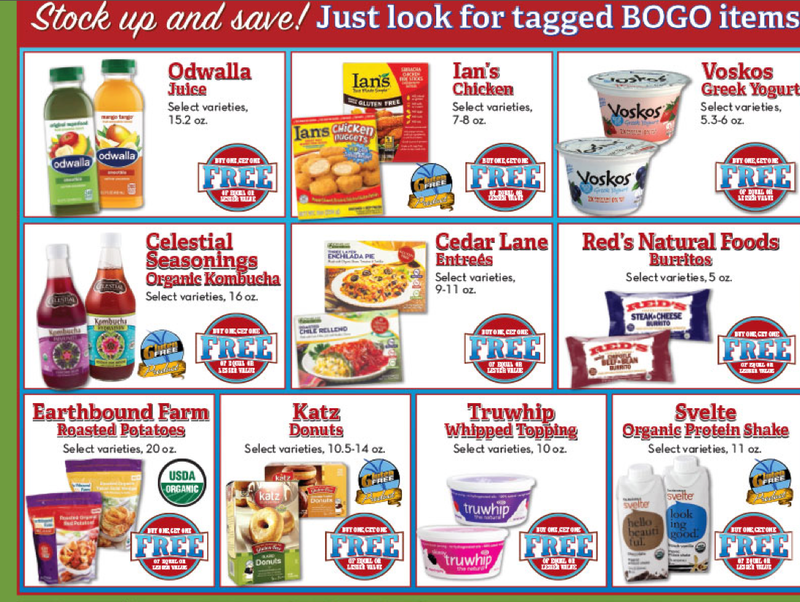 Sprouts also has a lot of buy-one-get-one ads going on. 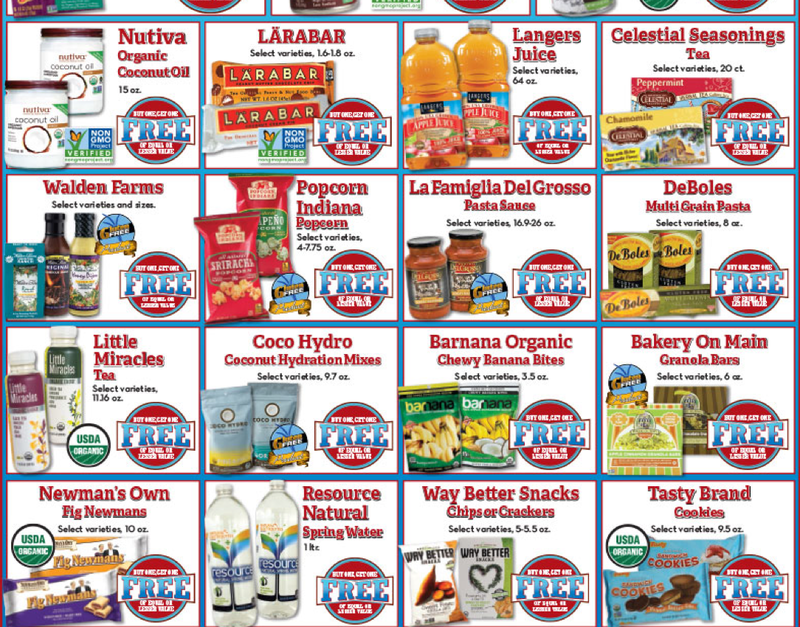 Because of the way the stores display their ads getting a photo up isn’t always as clear as I’d like, but here’s a try, so you can get an idea. Last week I mentioned that Fiesta shouldn’t be using quotation marks. This week they doubled down, much to my amusement. It’s late though, and my taped episode of The Goldbergs isn’t going to watch itself, so stay tuned. Four months! That’s crazy. 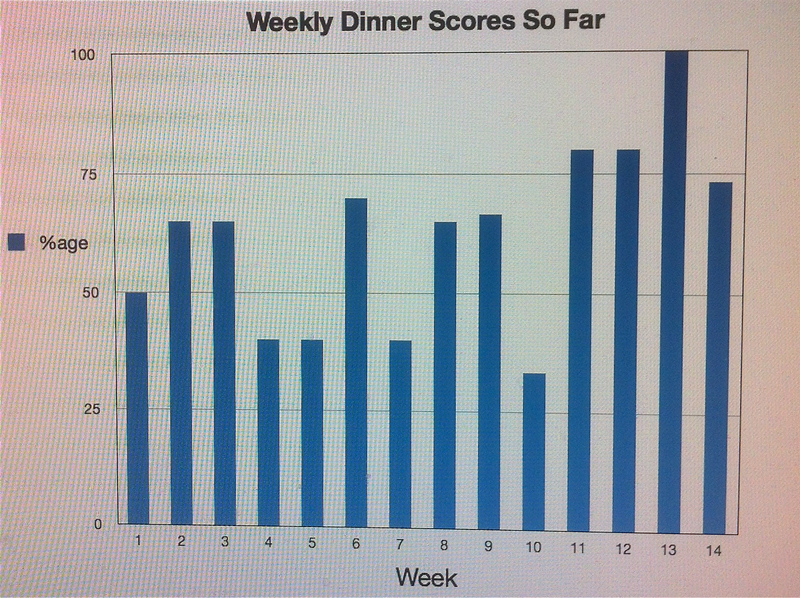 But math doesn’t lie–16 weeks is four months and that’s how long since I started the Internet Dinner Accountability Program for Remedial Family Dinner. I did abandon the whole ‘sit at the table’ idea, but overall we are eating out and ordering take-out less than we were before. Eating at home is the first step! I’ve also gotten completely out of the habit of creating more than one meal, which is a relief to the portion of my brain that had been devoted to ‘plain noodles for Tiny, noodles with pesto for Eldest, DH and I eat pasta with sauce and meat, and Boy gets meat and those other noodles he likes’. That part of my brain has been busy for about a decade now, and is enjoying kicking back and spending time thinking about what kind of tape JLo’s got her closet stocked with to make her Oscar gowns stay right the heck where they’re supposed to be (gaffer tape? superglue tape? straight up magic tape? is she a WIZARD??? ), and how to make a centrifuge out of Lego. The plan this week went pretty well. There was rearrangement, and we didn’t all eat together at all because of timing, but we all ate the dinner made with the exception of one skip night where DH and I ate out. Call it a ‘mental health’ meal (where mental health involves Happy Hour priced fried jalapenos). I did add in a night where Boy cooked dinner, and am working on adding a night for Tiny. Eldest is now doing cleanup twice a week in lieu of dinner, since she’s not home soon enough to take over cooking for a night. This is all part of my Everyone-Lives-Here-Everyone-Works-Here plan, which I’m hoping will eventually mean I don’t have all these piles of laundry all over the place. Through food, I shall see laundry done. That’s an Erma Bombeck quote, right? Mon: exactly the plan. 3 points. Tues: pulled pork, chicken, rice and beans, carrots and strawberries. 3 points. Wed: sesame chicken, rice, broccoli, plums. 3 points. 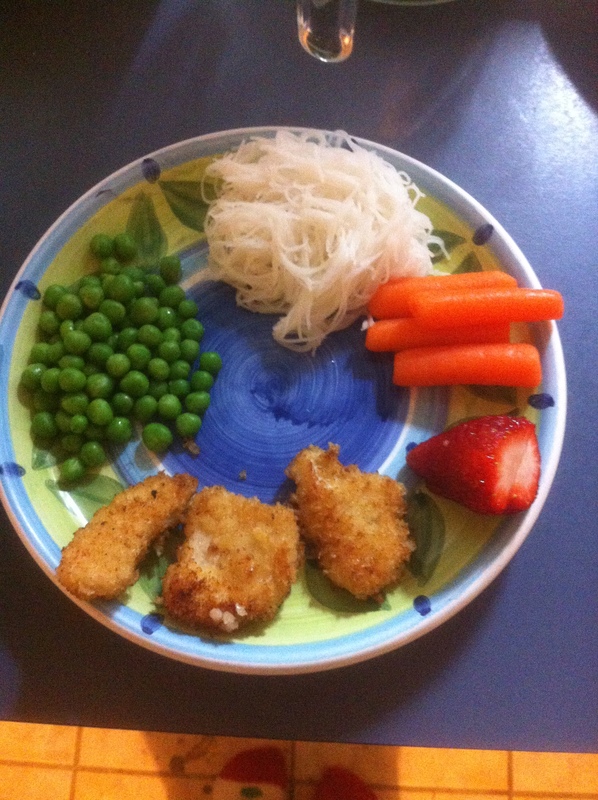 Thur: chicken strips, carrots, peas, strawberries, rice noodles (Boy cooked dinner!). 2 points. 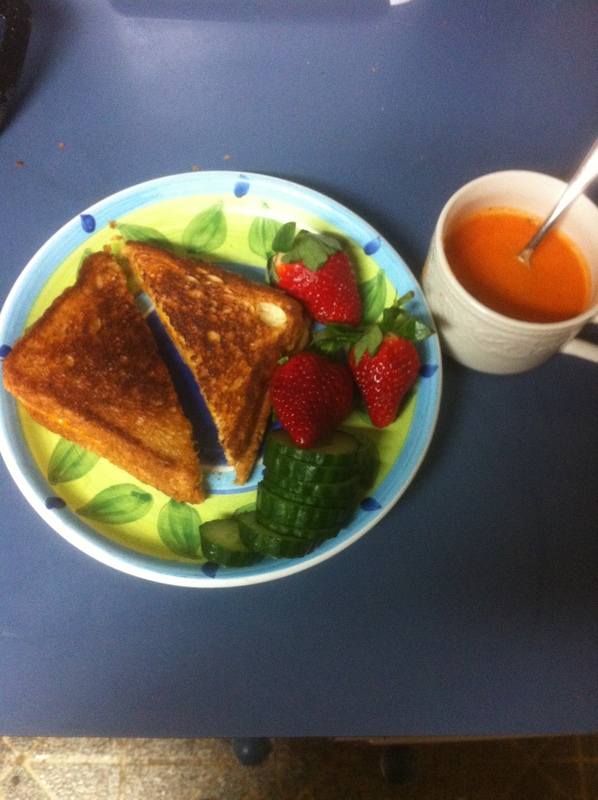 Fri: grilled sandwiches, leftovers. 1 point. 12 points is a damn fine week. I’m happy. And do you see that meal with the homemade chicken nuggets and peas? That’s what Boy chose to make! He was a gr eat sport about it. I gave him the protein/starch/raw veg/cooked veg/fruit plan, and he chose the foods to fill in. He breaded the chicken and cooked it, and we both had a good time in the kitchen getting him familiar with pan-frying and getting all the food ready at once. And then he also wanted to make a cake. In his defense, he mostly wanted to make the cake, not dinner. We’re doing a new thing where his dinner day is Thursday, though, and so the cooking doubled up on us. He made this cake. The stress level was pretty high (spoon in the Kitchen-aid is NOT a good thing! 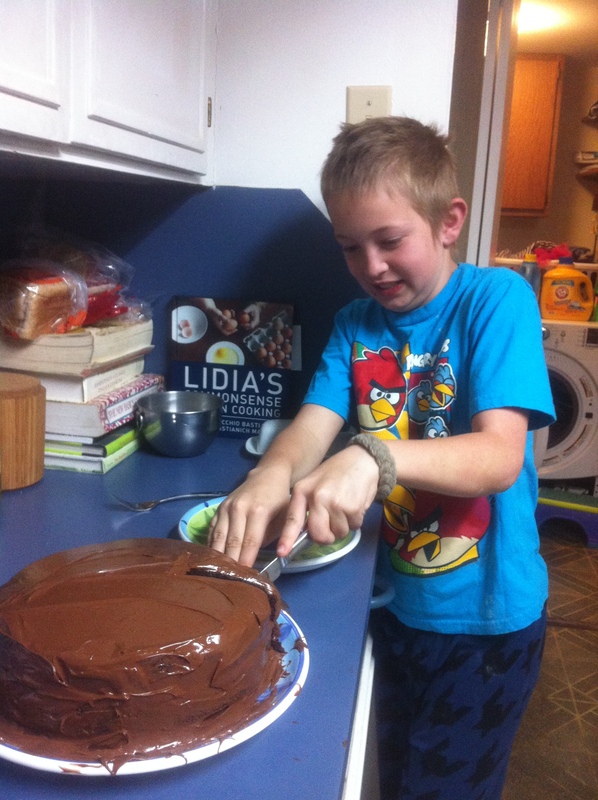 ), but the cake is wonderful, and he’s so happy with it. Plan post coming up, along with the long-promised Clearance Rack Index! So stay tuned, Cheepsters! I had to go back to 1992, make a bar graph and drag that sucker right into the future! The things I do for Cheepie! In reality, I created that graph on my Mac, and the only way I could get it from the Numbers (Apple’s answer to Excel) format to Will-Post-To-WordPress format was to take a freaking screenshot of the file, crop it in iPhoto, and then take a photo of it with my damn phone. Nothing like a bunch of incompatibility to make a girl feel like laughing. And all of this for a graph that I can only conclude needs more data before any real trend can be identified–though overall there is an upward slope indicated. So this is good. I gave up the ‘sit at the table all of us right now at once’ thing somewhere in there, and that’s part of the uptick. I did go by percentage to normalize between the 10 point scale and the 15 point scale. To avoid this ab workout in the future, software will be acquired, charts will be charted, and graphs will be graphed. Just give me a bit. I think that phone’s got powers. The kids all seem to think so. I like Trader Joe’s. The prices for things like milk and eggs aren’t crazy, so I can stop in to browse and still buy the things I actually need. The people working there seem happy. There is free coffee, the kids like hunting for the stuffed armadillo, and even if it is $3 now, Two-Buck-Chuck is a deal. Then when I’m done, I can leave the parking lot and go in whichever direction I need to. That shouldn’t be a plus, but given how HEBs seem to manage to make that a struggle, I feel like noting it as a positive. What’s not to love there? But having me click and load four pages before I can find a thing and know how much it is is more than I can happily deal with, so I’m picking one product a week from them to highlight. If ‘highlight’ means ‘mock in a loving way’. This week’s product is the Inner Bean, a companion to a product I am unfamiliar with called Inner Peas (Hi-yoooooo! is what DH would say here). It’s a snack, where black bean puree is mixed with rice flour and sunflower oil and baked. Sounds like a party in a bag, right? A party where there’s likely not a lot of beer and BBQ, but maybe it is your kind of party. If it is, you can get these bean-pod shaped wonders for $1.49 per 3 oz bag. Of course they’re bean-pod shaped. Otherwise the humor inherent in pretending baking bean dip is a good snack treat is completely lost. HEB is still running the special I find so strange, which is ‘buy Duracell batteries and get a free gallon of milk!’ Normally, the things they throw a combo coupon at make sense. Cookies would make sense. Buy cookies, get milk. Heck, buy brownie mix, get milk–that makes sense too. Is the appeal of free milk supposed to lure me into stocking up on batteries? Citrus is still cheap this week, though not like the weekend Fiesta sale a few weeks ago. HEB has the cheapest organic apples, and Fiesta the cheapest conventional. Fish is on sale everywhere, because of God, which is fine by me. If we could arrange for a religion to go ahead and strongly suggest the consumption of Macadamia nuts every May, thus causing a few weeks every year when they get cheap, I’d be fine with that, as well. Maybe I can get Scientology on that, help them rehab their image. And finally, as a sign of spring, asparagus is on sale, with HEB having the cheapest, and Randalls the most expensive, surprising no one at all. Several cereals/granola bars/fruit snacks are ‘Buy 4 for 1.49’ or ‘Buy 4 for 1.99’ each, with your store card. If you need to stock the pantry for breakfast or school lunches you could take a look. The $1.99 pork loin at Fiesta is the deal I’m making sure to get this week. I haven’t seen them at that price in a while, and I have room in the freezer. I cut them in thirds and vacuum seal, but they will fit in a gallon freezer bag. Hello, Chip People. I am writing with a concern about a sack of Spicy Thai chips we purchased last week. These chips are usually flavored with whatever goes into the Spicy Thai blend. This is an important part of the chip, especially in our family. These chips are purchased by my husband specifically so that I won’t eat his chips, which he can than ration out among however many chip-eating sessions he feels is appropriate. Without the Spicy Thai seasoning, we’re left with just chips, and he’s got no snack defense at all, upsetting the normally tranquil atmosphere of our home.